Benjamin “Ben” Géza Affleck is an American actor and filmmaker from Berkeley, California. Affleck is best known for his performances in ‘Shakespeare in Love’ (1998), ‘Good Will Hunting’ (1997), ‘Pearl Harbor’ (2001) and, ‘The Town’ (2010). His accolades include two Academy Awards, three Golden Globe Awards, two BAFTA Awards, and two Screen Actors Guild Awards. As of 2019, Ben Affleck’s net worth is estimated to be roughly $130 million dollars, making him one of the wealthiest actors in the world. Benjamin Géza Affleck was born on the 15th of August, 1972, in Berkeley. He is the son to Timothy Byers Affleck and Christine Anne Affleck. His father switched a lot of jobs before he finally became a photographer, and his mother was a school teacher in Cambridge, Massachusetts. Affleck has a younger brother called Casey Affleck who also is a movies actor. Soon after Casey’s birth, their parents divorced, and after the divorce, Affleck and his siblings moved to Massachusetts. Affleck began his career as an actor at a very young age. His rise to fame came in the 1990s when he starred in a series of roles. He made a stint in direction with his 16-minute short comedy called ‘Killed My Lesbian Wife, Hung Her on a Meat Hook, and Now I Have a Three-Picture Deal at Disney’. His biggest breakthrough in his career came in 1997 when he and his close friend Matt Damon got along. Affleck and Damon wrote a play together and when Affleck was at Harvard he starred in the play. They both later acted in the movie which was a story about a complicated math genius who is a janitor at MIT. In 2003, he acted in ‘Daredevil’ which was the movie version of the famous comic series and it was Affleck’s favorite since he was a little kid. The movie starred his ex-wife Jennifer Garner and the movie did very well commercially. He continued to perform in popular movies such as ‘Gone Babe Gone’ and ‘He’s Just Not That Into You’. In 2006, Affleck starred in a film called ‘Hollywoodland’, which was a biopic on the critically acclaimed and famous artist George Reeves. He received the Best Actor award at the Venice Film Festival and was nominated for a Golden Globe. A few years later, Affleck directed another movie ‘Argo’ alongside George Clooney. He won a Golden Globe, Directors Guild of America awards, BAFTA award for his direction in the movie. The following year, he hosted the sketch comedy show ‘Saturday Night Live’. In 2014, Ben Affleck starred in the psychological thriller ‘Gone Girl’, where he portrayed the character of a husband, who is accused of murder. In 2016, he starred as Batman in ‘Batman v Superman: Dawn of Justice’. This year, Affleck will perform in an upcoming movie called ‘Triple Frontier’ which will have its initial release on 15th of March. As of 2019, Ben Affleck’s net worth is estimated to be roughly $130 million dollars. When we form relationships and make commitments, the work has only just begun. And as Ben Affleck acknowledged during his 2013 Oscar acceptance speech, marriage involves work. Money and fame don’t change everything. Red carpet moments may seem magical, but life’s challenges make no exception for those in the limelight. While celebrity marriages haven’t been known for their longevity, there are plenty of long-term success stories. Public speculation, storytelling, and constant quizzing aren’t productive or helpful for those who are in the middle of making important life decisions. Anxiety and grief are rarely lessened by being “the talk of the town”. Ben Affleck is, without a doubt, an incredible actor. He’s been collaborating with some of the best directors and actors in the history such as Gwyneth Paltrow, Leonardo DiCaprio, and Matt Damon. Affleck began acting at a very young age and has since then received awards such as two Academy Awards, three Golden Globe Awards, two BAFTA Awards, and two Screen Actors Guild Awards. As of 2019, Ben Affleck’s net worth is roughly $130 million dollars. 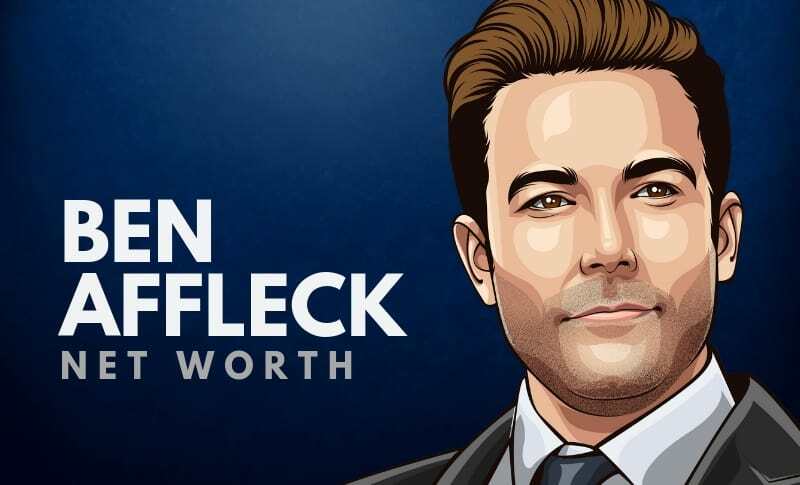 What do you think about Ben Affleck’s net worth? Leave a comment below.